Stainless steel case ENTIRELY CLAD/COATED IN BLACK RUBBER, this is accomplished by a complex vulcanization process that leaves the watch with a matte black rubber coating, giving the watch a unique feel & look. The rubber also provides an additional layer of protection against impacts. 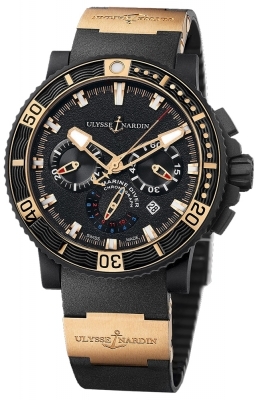 Black rubber clad bezel with raised polished rose gold graduation elements. Matte & polished applied rose gold hour markers with luminous center fill. Matte rose gold rimmed skeleton hour & minute hands with luminous filled tips. Black rubber strap with 2 integrated solid 18kt rose gold elements engraved with the"ULYSSE NARDIN" brand name each element. Large rose gold & red tipped central seconds counter hand. 30 minutes counter sub-dial located at the 9 o'clock position. 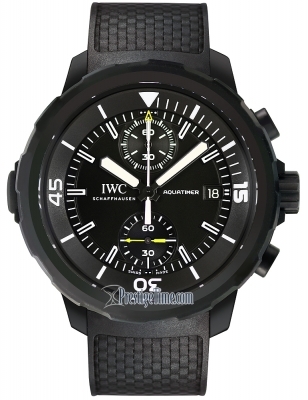 Continuous small seconds sub-dial located at the 3 o'clock position. 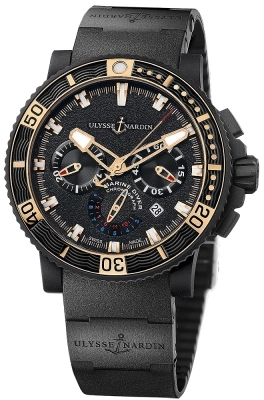 Ulysse Nardin Caliber UN-35, beats at 28,800 vph, contains 57 Jewels & has an approximate power reserve of 42 hours. The rotor has a ruthenium (black) finish & is visible through the case back.